Throughout the year, teams of Audubon volunteers work to restore and re-create native communities at Elkhorn Creek Preserve. Since only local seeds are used, please be careful not to bring any other seeds onto the property. Everyone is welcome to participate in seed collecting and planting, brush cutting, weed removal, trail maintenance, and helping with prescribed burns. See the Calendar for information on activities you would like to join. 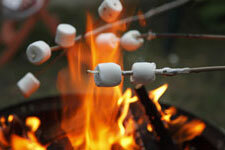 In addition to stewardship activities, monthly campfires are held at the Preserve from May through October. 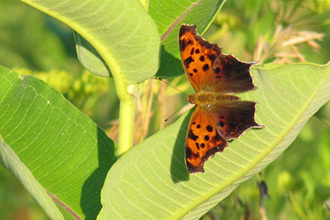 A May Bird Festival and a summer Butterfly Festival are scheduled each year. Check the Calendar for dates and times. 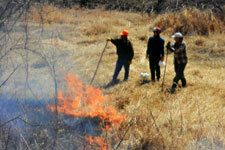 Put your name on our contact list for prairie burns each spring. Since weather can foil even the best-laid burn plans, we don't schedule burns far in advance. When conditions are right, we call you, and if you're available, you join our crew. Usually you'll get the call 24-48 hours beforehand. 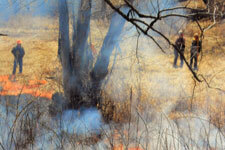 The burn season typically runs from early March through mid-April. Don't worry if you lack experience. There are some tasks on burn days that are fine for novices. Snacks and water are provided. To get on the list, contact us or call Mary Blackmore at 815-938-3204. On your visit to Elkhorn Creek Biodiversity Preserve you can connect with nature. Relax on a creek-side bench, explore a variety of natural habitats, or join us in restoration activities. Hike around, watch for birds, listen for frogs, take pictures, and just relax. The Elkhorn Creek brochure contains more details and trail maps. Elkhorn Creek Biodiversity Preserve, on 43 acres near Forreston, Illinois, is home to a wide diversity of species. To date, more than 400 species have been identified, including 132 species of birds, 80 species of insects, and 208 species of plants. Our list of identified species is growing each year. Although relatively small in size, the Elkhorn Creek Biodiversity Preserve contains an impressive variety of geologic and hydrologic features and their associated plant communities. Situated over a small series of geologic faults, the Preserve features outcroppings of both St. Peter sandstone and Ordovician-age dolomite. These geological differences result in the presence of both acid- and alkaline-wetlands  adding greatly to the area’s biodiversity. Additional wetland features include sedge meadows, a small brook, and a portion of the Preserve's namesake, Elkhorn Creek. Several remnant hillside prairies can be found at the Preserve, with Little Bluestem the dominant grass. Various forbs (prairie wildflowers) are present as well. The woodland component of the preserve includes oak savannah areas as well as a bit of floodplain forest. 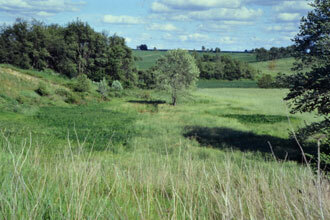 The Preserve is located about three miles southwest of Forreston, Illinois, in northwestern Ogle County. It is at the intersection of West Grove and Freeport Roads on the southeast corner. The parking area is accessed from West Grove Road. Why Is This Called a "Biodiversity Preserve?" The term biodiversity refers to the variety of biological units in the area. 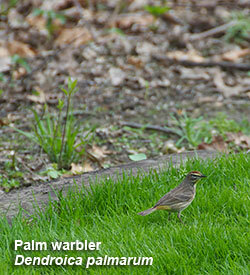 Both Northwest Illinois Audubon Society preserves have many local populations of native species to build upon. Our stewardship activities on each Preserve revolve around creating conditions to expand these local populations. As we become more familiar with each preserve, we are discovering more and more native species waiting for our loving touch. Donate to help sustain Elkhorn Creek  your support is always welcome. We are currently building a fund to create a visitors' kiosk at the parking area and to extend our local communication and education efforts. Visit both of our preserves and join our Society if you'd like to get the bi-monthly newsletter and stay well-informed. 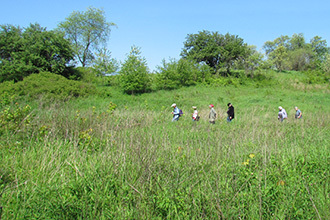 The land of the Elkhorn Creek Biodiversity Preserve was purchased from a local family in 1999 by the Northwest Illinois Audubon Society in partnership with the Prairie Preservation Society of Ogle County. In 2010, the Northwest Illinois Audubon Society acquired full ownership of the Preserve in a transaction that assisted the Prairie Preservation Society in their purchase of a valuable prairie remnant, the Sand Ridge Prairie. Our Society's full ownership was made possible by a generous bequest from the estate of Clarence Mitchell. 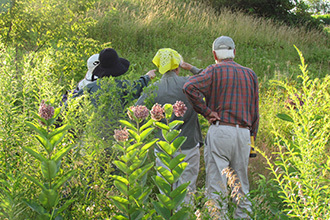 Since the original purchase, extensive volunteer effort has been invested in the preservation and restoration of this unique piece of Illinois biodiversity. The Preserve is open to all visitors anytime during daylight hours. Permitted activities include hiking, bird watching, nature photography, frog listening, and botanizing. Horses, dogs, bikes and off-road vehicles are not allowed.